During Portuguese colonial rule, a large minority of people of Portuguese descent lived permanently in almost all areas of the country, and Mozambicans with Portuguese heritage at the time of independence numbered about 360,000. Many of these left the country after independence from Portugal in 1975. There are various estimates for the size of Mozambique's Chinese community, ranging from 7,000 to 12,000 as of 2007. The Bahá'í Faith has been present in Mozambique since the early 1950s but did not openly identify itself in those years because of the strong influence of the Catholic Church which did not recognise it officially as a world religion. The independence in 1975 saw the entrance of new pioneers. In total, there are about 3,000 declared Baha'is in Mozambique as of 2010. The Administrative Committee is located in Maputo. Beira is the fourth largest city in Mozambique. It lies in the central region of the country in Sofala Province, where the Pungwe River meets the Indian Ocean. Beira had a population of 397,368 in 1997, which grew to 530,604 in 2019. It holds the regionally significant Port of Beira which acts as a gateway for both the central interior portion of the country as well as the land-locked nations of Zimbabwe, Zambia and Malawi. Beira was originally developed by the Portuguese Mozambique Company in the 19th century, and directly developed by the Portuguese colonial government from 1947 until Mozambique gained its independence from Portugal in 1975. In March 2019, 90% of the city was destroyed by Cyclone Idai. The cuisine of Mozambique has deeply been influenced by the Portuguese, who introduced new crops, flavorings, and cooking methods. The staple food for many Mozambicans is ncima, a thick porridge made from maize/corn flour. Cassava and rice are also eaten as staple carbohydrates. All of these are served with sauces of vegetables, meat, beans or fish. Other typical ingredients include cashew nuts, onions, bay leaves, garlic, coriander, paprika, pepper, red pepper, sugar cane, corn, millet, sorghum and potatoes. The Mozambique Liberation Front (FRELIMO) (Portuguese pronunciation: [fɾeˈlimu]), from the Portuguese Frente de Libertação de Moçambique is the dominant political party in Mozambique. Founded in 1962, FRELIMO began as a nationalist movement fighting for the independence of the Portuguese Overseas Province of Mozambique. Independence was achieved in June 1975 after the Carnation Revolution in Lisbon the previous year. At the party's 3rd Congress in February 1977, it became an officially Marxist–Leninist political party. It identified as the Frelimo Party (Partido Frelimo).The Frelimo Party has ruled Mozambique since then, first as a one-party state. It struggled through a long civil war (1976–1992) against an anti-Communist faction known as Mozambican National Resistance or RENAMO. The insurgents from RENAMO received support from the then white-minority governments of Rhodesia and South Africa. The Frelimo Party approved a new constitution in 1990, which established a multi-party system. Since democratic elections in 1994 and subsequent cycles, it has been elected as the majority party in the parliament of Mozambique. LAM - Mozambique Airlines, S. A. (LAM - Linhas Aéreas de Moçambique, S. A.) or Linhas Aéreas de Moçambique, Ltd., operating as LAM Mozambique Airlines (Portuguese: LAM Linhas Aéreas de Moçambique), is the flag carrier of Mozambique. The airline was established by the Portuguese colonial government of Mozambique in August 1936 (1936-08) as a charter carrier named DETA - Direcção de Exploração de Transportes Aéreos, and was renamed in 1980 following reorganisation. This is an alphabetical list of films produced in Mozambique. The following is a list of Presidents of Mozambique, since the establishment of the office of President in 1975. Maputo (Portuguese pronunciation: [mɐˈputu]), officially named Lourenço Marques until 1976, is the capital and most populous city of Mozambique. 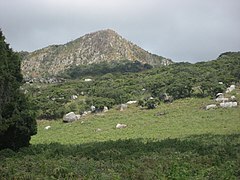 Located near the southern end of the country, it is positioned within 120 km of the Eswatini and South Africa borders. The city has a population of 1,101,170 (as of 2017) distributed over a land area of 347 km2 (134 sq mi). The Maputo metropolitan area includes the neighbouring city of Matola, and has a total population of 2,717,437. Maputo is a port city, with an economy centered around commerce. It is also noted for its vibrant cultural scene and distinctive, eclectic architecture.Maputo is situated on a large natural bay on the Indian Ocean, near where the rivers Tembe, Mbuluzi, Matola and Infulene converge. The city consists of seven administrative divisions, which are each subdivided into quarters or bairros. The city is surrounded by Maputo Province, but is administered as a self-contained, separate province since 1998. Maputo City is the geographically smallest and most densely populated province in Mozambique. Maputo is a cosmopolitan city, with Bantu, Portuguese, and, to a lesser extent, Arabic, Indian, and Chinese languages and cultures present. The area on which Maputo stands was first settled as a fishing village in the 1500s. It was soon named Lourenço Marques, after the navigator of the same name who first explored the area in 1544. The modern city traces its origins to a Portuguese fort established on the site in 1781. A town grew around the fort starting around 1850, and in 1877, it was elevated to city status. 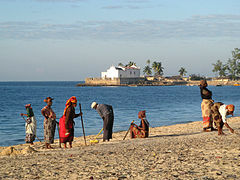 In 1898, the colony of Portuguese Mozambique relocated its capital there. In the late 19th and early 20th centuries, Lourenço Marques grew both in population and economic development as a port city. Upon Mozambican independence in 1975, the city became the national capital and was renamed Maputo. During the Mozambican Civil War, the city's economy was devastated. When the war ended, the FRELIMO government launched a program to revive the city's economy, and to clean up the city by forcibly removing criminals, squatters, and undocumented residents. Since then, Maputo's economy has recovered and stability has returned, though crime remains a problem.Maputo has a number of landmarks, including Independence Square, City Hall, Maputo Fortress, the central market, Tunduru Gardens, and Maputo Railway Station. Maputo is known an aesthetically attractive, if dilapidated, city. With wide avenues lined by jacaranda and acacia trees, it has earned the nicknames City of Acacias and the Pearl of the Indian Ocean. The city is known for its distinct, eclectic architecture, with Portuguese colonial Neoclassical and Manueline styles alongside modern Art Deco, Bauhaus, and Brutalist buildings. The historic Baixa de Maputo district is the downtown area. Maputo has a vibrant cultural scene, with many restaurants, music and performance venues, and local film industry. Maputo's economy is centered around its port, through which much of Mozambique's imports and exports are shipped. The chief exports include cotton, sugar, chromite, sisal, copra, and hardwood. In addition to trade, the city has robust manufacturing and service sectors. Several colleges and universities are located in Maputo, including Pedagogical University, São Tomás University, and Eduardo Mondlane University, the oldest in the country. The Mozambican Civil War was a civil war fought in Mozambique from 1977 to 1992. Like many regional African conflicts during the late twentieth century, the Mozambican Civil War possessed local dynamics but was also exacerbated greatly by the polarizing effects of Cold War politics. The war was fought between Mozambique's ruling Marxist Front for the Liberation of Mozambique (FRELIMO) and anti-communist insurgent forces of the Mozambican National Resistance (RENAMO).RENAMO opposed FRELIMO's attempts to establish a socialist one-party state, and was heavily backed by the anti-communist governments in Rhodesia and South Africa. For their part, the Rhodesian and South African defence establishments used RENAMO as a proxy to erode FRELIMO support for militant nationalist organisations in their own countries and to disrupt FRELIMO's socialist goals. Over one million Mozambicans were killed in the fighting or starved due to interrupted food supplies; an additional five million were displaced across the region. 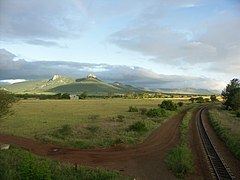 The Mozambican Civil War destroyed much of Mozambique's critical rural infrastructure, including hospitals, rail lines, roads, and schools. FRELIMO's security forces and RENAMO insurgents were accused of committing numerous human rights abuses, including using child soldiers and salting a significant percentage of the countryside indiscriminately with land mines. 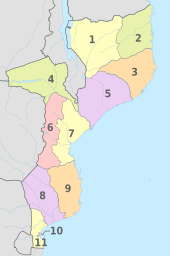 Three neighboring states—Zimbabwe, Tanzania, and Malawi—eventually deployed troops into Mozambique to defend their own vested economic interests against RENAMO attacks.The Mozambican Civil War ended in 1992, following the collapse of Soviet and South African support for FRELIMO and RENAMO, respectively. Direct peace talks began around 1990 with the mediation of the Mozambican Church Council and the Italian government; these culminated in the Rome General Peace Accords which formally ended hostilities. As a result of the Rome General Peace Accords, RENAMO units were demobilised or integrated into the Mozambican armed forces and the United Nations Operation in Mozambique (ONUMOZ) was formed to aid in postwar reconstruction. Tensions between RENAMO and FRELIMO flared again between 2013 and 2018, prompting the former to resume its insurgency. The Mozambique national football team (Portuguese: Seleção Moçambicana de Futebol), popularly known as Os Mambas, represents Mozambique in association football and is controlled by the Mozambican Football Federation, the governing body for football in Mozambique. Mozambique have never qualified for a FIFA World Cup, but they have qualified for four Africa Cup of Nations in 1986, 1996, 1998 and most recently the 2010 Africa Cup of Nations in Angola, being eliminated in the first round in all four. Mozambique are currently ranked 97th in the FIFA World Rankings, with their highest ever ranking of 66th in November 1996. Mozambique's home ground is Estádio do Zimpeto in the capital city Maputo, and can hold 45,000 spectators. The team's current head coach is the former Portugal international Abel Xavier, who has been in charge since February 2016. Mozambique – United States relations are bilateral relations between Mozambique and the United States. The People's Republic of Mozambique (Portuguese: República Popular de Moçambique) was a communist state that existed in Mozambique from 1975 to 1990. The People's Republic of Mozambique was established in Portuguese East Africa in 1975 by the Mozambique Liberation Front ("FRELIMO") led by Samora Machel, shortly after the country gained independence from Portugal. FRELIMO established a Marxist-Leninist one-party state with itself as the vanguard party, creating an authoritarian government and pursuing socialist policies such as widespread nationalization. The People's Republic of Mozambique held close ties with other communist states such as the People's Republic of Angola and the Soviet Union, which it aligned with in the Cold War, and was an observer of COMECON. From 1977, the FRELIMO was engaged in the Mozambican Civil War with the Mozambique National Resistance ("RENAMO"), an anti-communist movement initially supported and financed by the Rhodesia and later by South Africa.In 1990, the end of the Cold War and a stalemate in the civil war led to a peace accord between FRELIMO and RENAMO, dissolving the People's Republic and reforming Mozambique as a non-communist democratic, multi-party state. The Portuguese Colonial War (Portuguese: Guerra Colonial Portuguesa), also known in Portugal as the Overseas War (Guerra do Ultramar) or in the former colonies as the War of Liberation (Guerra de Libertação), was fought between Portugal's military and the emerging nationalist movements in Portugal's African colonies between 1961 and 1974. The Portuguese regime was overthrown by a military coup in 1974, and the change in government brought the conflict to an end. The war was a decisive ideological struggle in Lusophone Africa, surrounding nations, and mainland Portugal. The prevalent Portuguese and international historical approach considers the Portuguese Colonial War as was perceived at the time: a single conflict fought in three separate theaters of operations: Angola, Guinea-Bissau and Mozambique (sometimes including the 1961 Indian Annexation of Goa). People's Movement for the Liberation of Angola, National Liberation Front of Angola, National Union for the Total Independence of Angola in Angola, African Party for the Independence of Guinea and Cape Verde in Portuguese Guinea, and the Mozambique Liberation Front in Mozambique. During the ensuing conflict, atrocities were committed by all forces involved.Throughout the period Portugal faced increasing dissent, arms embargoes and other punitive sanctions imposed by the international community. By 1973, the war had become increasingly unpopular due to its length and financial costs, the worsening of diplomatic relations with other United Nations members, and the role it had always played as a factor of perpetuation of the entrenched Estado Novo regime and the non-democratic status quo. The end of the war came with the Carnation Revolution military coup of April 1974. The withdrawal resulted in the exodus of hundreds of thousands of Portuguese citizens plus military personnel of European, African and mixed ethnicity from the former Portuguese territories and newly independent African nations. This migration is regarded as one of the largest peaceful migrations in the world's history.The former colonies faced severe problems after independence. Devastating and violent civil wars followed in Angola and Mozambique, which lasted several decades, claimed millions of lives, and resulted in large numbers of displaced refugees. Economic and social recession, authoritarianism, lack of democracy and other elemental civil and political rights, corruption, poverty, inequality, and failed central planning eroded the initial revolutionary zeal. A level of social order and economic development comparable to what had existed under Portuguese rule, including during the period of the Colonial War, became the goal of the independent territories.The former Portuguese territories in Africa became sovereign states, with Agostinho Neto in Angola, Samora Machel in Mozambique, Luís Cabral in Guinea-Bissau, Manuel Pinto da Costa in São Tomé and Príncipe, and Aristides Pereira in Cape Verde as the heads of state. Visitors to Mozambique unless they come from one of the visa exempt countries can obtain a visa on arrival at all border posts or from one of the Mozambican diplomatic missions.Mozambique is part of SADC meaning that members of other SADC countries do not require a tourist visa if visiting Mozambique for tourism purposes.